We are a leading Manufacturer of rh-658-5l rock drill dry, wet rock drill machine, spade handle rock drill, rh658 rock drill dry and pneumatic rock drill from Pune, India. This air flushed medium duty Rock Drill Dry machine and rock drills is capable of drilling 27-48 mm diameter holes with H22 integral steel upto a depth of 6 meters. Rock Drills can be used for holes upto 20 feet or over but are most efficient when confined to holes of not over 10 to 12 feet. Silencer in impact and wear resistant polyurethane reduces noise levels by more than 50%. Built-in air-flushing: Take the built-in air-flushing for example. As you drill, the hole is kept clean by a powerful jet of air. This boosts productivity in two ways. First, it speeds up the actual drilling process, since the drill bit has a cleaner surface to work on. Two, when the drilling is finished, you don't need to clean the hole before blasting. Easier collaring: We've also made collaring faster and easier. 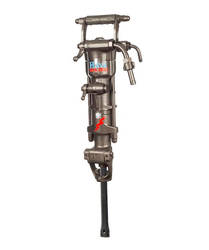 Haryrock drills are powerful, but the power is easy to handle thanks to a strapless throttle. This helps you keep the tip of the tool exactly where you want it, right from the beginning. 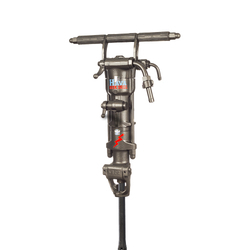 Drilling rate of 33 mm drill bit at an air pressure of 6kg/cm2. Due to varying rock condition, actual result may be greater of lesser than those listed. We are offering Wet Rock Drill Machine to our esteemed clients with the assurance of flawless usage. 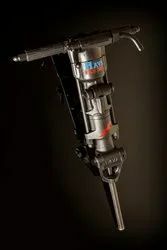 Offered range of products is water flushed hand held medium duty rock drill machine and used for inclined dustless drilling. Integrated with kick latch retainer and inbuilt air flushing, these machines offer optimum performance. Our customers can source these products easily with the assurance of efficient performance. 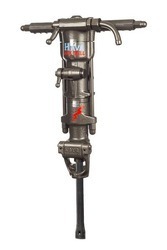 This air flushed medium duty rock drill machine and rock drills is capable of drilling 27-48 mm diameter holes with H22 integral steel upto a depth of 6 meters. Rock Drills is used for horizontal or inclined dustless drilling in conjunction with a pusher leg such as in underground mines and tunnels. Powerful drilling for higher penetration. 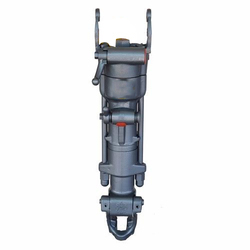 In order to cater the diverse requirements of our customers, we are engaged in offering a quality range of Spade Handle Rock Drill. Pneumatic Rock Drill is a top choice because of its low air consumption and a very high drill rate to drill weight ratio. It can also be used as a sinker because of its low weight.